Have you ever wanted to promote your artwork or other products online but are not sure how and do not want to invest in a website and monthly fees? In one day you can have your own free online portfolio up and running. Blogs are a great way to share your products with prospective collectors, galleries and friends. customize your blog and much more. 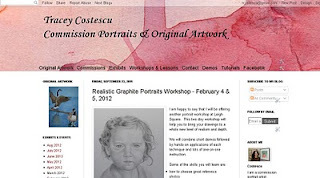 Please bring a laptop with several images of your artwork or products in a folder and please download http://picasa.google.com/ to your desktop prior to class. Please contact me at info@stateofartportraits.com for more information or to register.